The search for extrasolar planets has established itself as a major research field in Astronomy in the last decade and promises to be one of the main science drivers for decades to come. Over 20 ground-based experiments using the transit technique are being undertaken worldwide. Several missions from space have been launched or are to be launched in the near future, such as MOST, Corot, and Kepler. Presently 16 transiting extrasolar planets are known, several having been announced at the workshop itself. 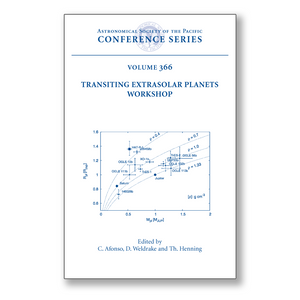 These proceedings of the Transiting Extrasolar Planets Workshop held September 25-28 at the Max Planck Institute for Astronomy in Heidelberg address several topics related to Transit Astronomy. They offer a detailed overview of the status of the field, regarding observational strategies, methods to select transits, detections and characterization of planets, as well as new approaches and new methodologies.